Image: Repsol, SEG. Click for the abstract. SEG Day 2. In the session entitled Exploration and Uncertainty Analysis, I was underwhelmed with the few talks that I attended, except for the last one of the session entitled, Measuring time-map uncertainty. It is commonly uttered that different data processing companies will produce different results; seismic processing is non-unique, and so on. But rarely do I get to see real examples of the kind of variances that can occur. Bruce Blake from Repsol showed seismic imaging results that came back from a number of contractors. The results were truly shocking. The example he showed was an extreme case of uncertainty caused by inadequate static solutions caused by the large sand dunes in Libya. 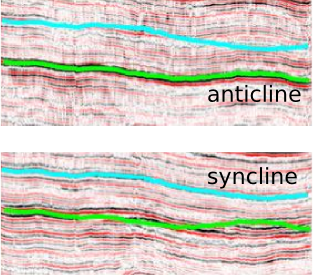 The key point for me is exemplified by the figure shown on the right: the image from one vendor suggests a syncline, the image from the other suggest an anticline. Beware! In the borehole sonic session, Xinding Fang, a student from MIT, reinforced a subtle but profound idea: it is tricky to measure the speed of sound in a rock when you drill a hole into it. The hole changes the stress field, and induces an anisotropic stiffness around the circumference of the borehole where sonic tools make their measurements. And since waves take the shortest travel path from source to receiver, speeds that are measured in the presence of an artificial stress are wrong. Image: Xindang Fang, SEG. Click for the abstract. The bigger issue here that Xinding has elucidated is that we routinely use sonic logs to make time-depth relationships and tie wells, especially in the absence of a check-shot survey. If it works, it works, but if ever discrepancies exists between seismic and well, the interpreter applies a stretch or a squeeze without much thought. Some may blame the discrepancy on dispersion alone, but that's evidently too narrow. Indeed, we rarely bother to investigate the reasons. There's a profound point here. We have to drop the assumption that logs are the 'geological' truth upon which to hang an interpretation. We have to realize that the act of making the measurement changes the very thing we want to measure.